In 1934, a US magazine published an encrypted message a reader had found in an old document. The solution is not known to me. 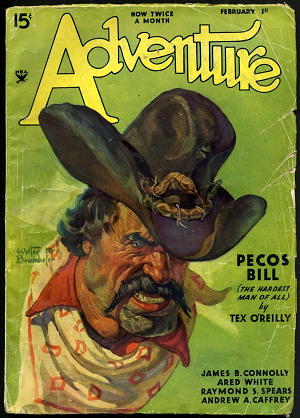 The US magazine Adventure was considered a “pulp magazine”. It mainly published stories as they are known from dime novels, as well as some non-fictional content. There were times when Adventure sold more than a million copies per issue. Many who read this paper did not admit it. 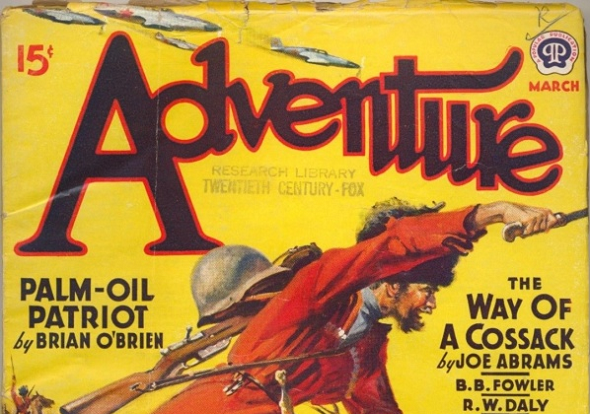 For more than 60 years, Adventure was one of the most popular US publications, before it was finally discontinued in 1971. Even today, there are Adventure fans who try to keep the memories of this once beloved and hated journal alive. Adventure featured a popular column named “Ask Adventure”. In this column, readers could ask questions that were answered by experts. 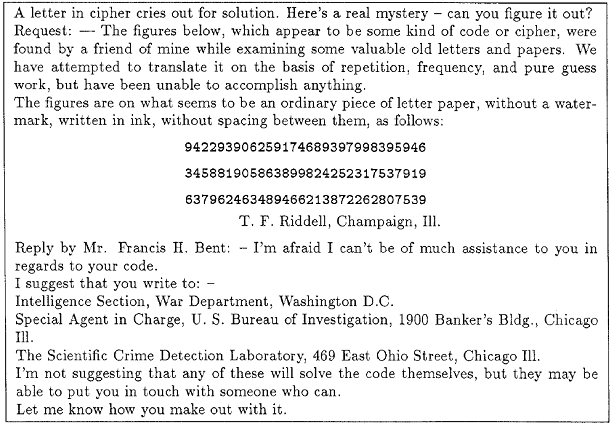 In issue July 1934 (page 124) a certain T. F. Ridell from Champaign, Illinois, asked if somebody could decipher an encrypted message a friend of him had found in some old documents. The answer to this question was delivered by an Adventure expert named Francis H. Bent. He wrote: “I’m afraid, I can’t be of much assistance.” He recommended Bent to contact the War Department, the FBI or the Police Laboratory in Chicago – perhaps, one of this institutions had a skilled codebreaker at hand who would find the solution. There’s no doubt that the answer given by this alleged crypto expert is a little unsatisfactory. On the other hand, this cryptogram seems to be hard to solve. Apparently, the editorial staff of Adventure never received a solution from their readers. In 1988, the scientific magazine Cryptologia published the message (issue 1988/4), but again, nobody came up with the solution. The paper clipping shown above is from the Cryptologia article. I have never seen the original published in Adventure. After my first blog post about this cryptogram (published in 2015 in German), I received several comments. Especially, Stefan Wagner and Norbert Biermann published interesting analyses. However, no solution was found. It is, of course, not even clear if this message is an encrypted text at all. Now I hope, the my second article about this mystery will lead to some new ideas. I’m looking forward to your comments. The cryptogram is on page 124 (126 in the scan). 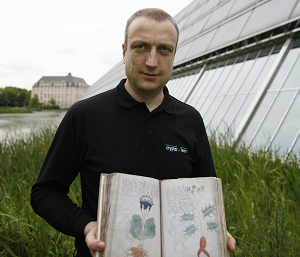 It is crypted by using a code book. A code book is a book which has a list of words and each word has a unique numerical value, in this case a triplet, 3 digits. And for decrypting an ascending list of numerical values with the assigned words. To avoid cracking this code with statistical analysis, most used words like “and”, “the”, “I”, “you” “a”, “an”, and so on, have more than one value assigned, so trying to break that code with statistics will be a FAIL. We have 3 lines with 30 digits each, so 90 digits in total. As you can see, the often used word “you” has 2 triplets assigned. Decrypt the 90 digits with this code book and you’ll get Poe’s poem again. Follow the instructions and try it, it works. If this message is coded with a code book, and we only know the coded message, but not the book and original message, we must guess the two missing parts. And the result makes sense, Poe wrote the poem in the 18somethings, so it was well known in the 1930’s. And the result is the complete first verse of that poem, not some random text, or it stops in the middle of a sentence or a word, it’s the full 5 first lines. So, as far as i can see in Klausis Blog, this is the best solution available. My point was that you can take any text with 30 words and make up a ‘code book’ assigning the 3-digit-numbers to the words.